The content of this article provides interesting history, facts and information about Weapons of the Roman Soldiers. The main dependence of the Roman legion was on the infantry and this page describes the weapons carried by a Roman infantry soldier. Besides the armor and weapons of the legionary, he usually carried on the marches provisions for two weeks, three or four stakes used in forming the palisade of the camp, besides various tools, altogether a burden of sixty or eighty pounds per man. The life of a Roman legionary was hard and disciplined. Roman Soldiers were trained to march twenty miles a day. 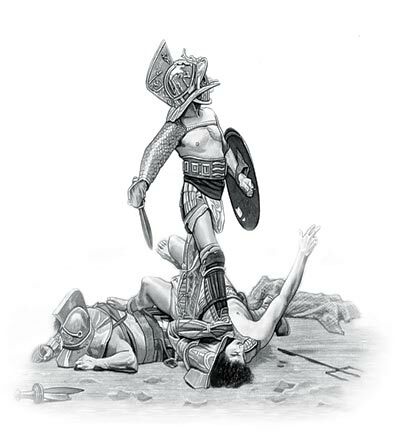 The main dependence of the Roman legion was on the infantry, which wore heavy armor consisting of helmet, breastplate, greaves on the right leg, and on the left arm a buckler. The breastplate, or cuirass, was generally made of metal, and sometimes was highly ornamented. Chain-mail was also used. The greaves were of bronze or brass, with a lining of leather or felt, and reached above the knees. The shield worn by the heavy-armed infantry was not round, but oval or oblong, adapted to the shape of the body and was made of wood or wicker-work. The shield was often used as a weapon in its own right. The weapons of the Roman Soldiers consisted of a light spear, a pilum, or javelin, over six feet long, terminated by a steel point and a short cut-and-thrust sword with a double edge. In the time of the empire, when the legion was modified, the infantry wore cuirasses and helmets, and carried a sword and dagger. The select infantry were armed with a long spear and a shield; the rest, with a pilum. Each man carried a saw, a basket, a mattock, a hatchet, a leather strap, a hook, a chain, and provisions for three days. The Equites (cavalry) wore helmets and cuirasses, like the infantry, having a broadsword at the right side, and in the hand a long pole. A buckler swung at the horse's flank. They were also furnished with a quiver containing three or four javelins. The content of this Weapons of the Roman Soldiers category provides free educational details, facts and information for reference and research for schools, colleges and homework. Refer to the Colosseum Sitemap for a comprehensive search on interesting different categories containing the history, facts and information about the people of Ancient Rome.